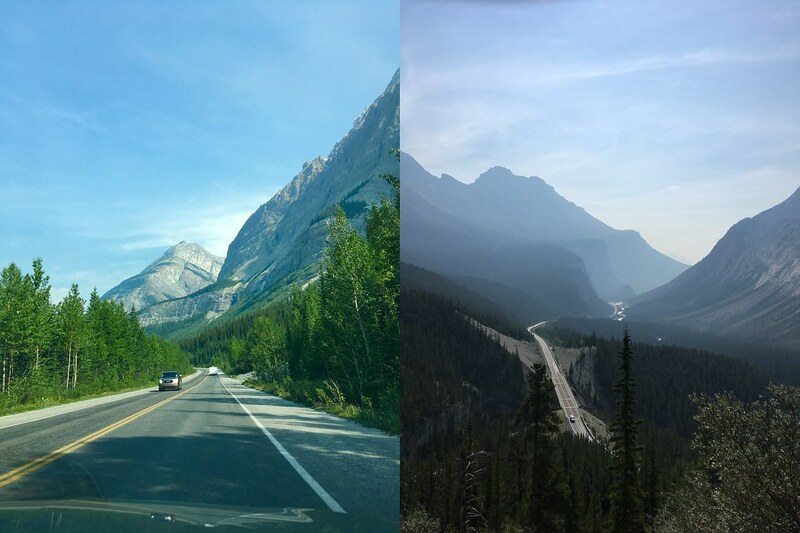 I spent part of my summer exploring the beautiful scenery of western Canada with my parents; we had an amazing time and everything about this wonderful country impressed me; I really hope to go back one day! 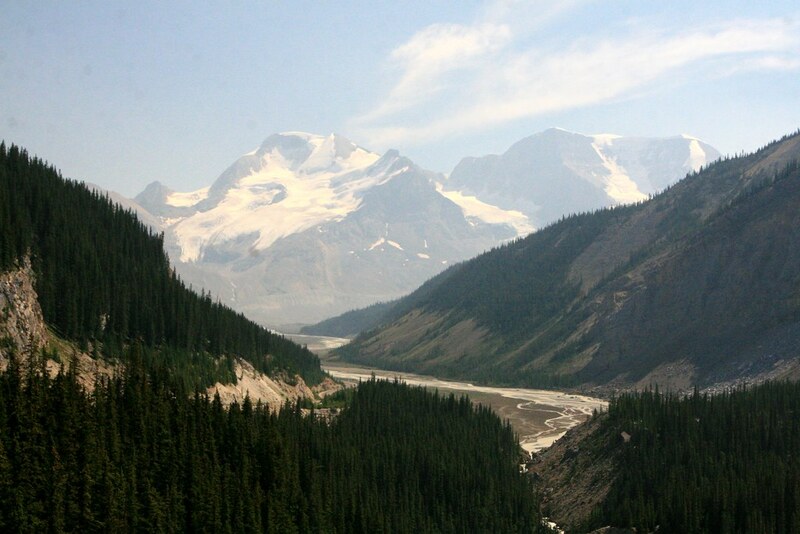 When I first started researching some of things we could do, I read about the Icefields Parkway: a couple of hundred kilometres of road connecting Jasper to Banff which is supposed to be one of the most beautiful drives in the world, taking in lakes, mountains, glaciers, pine forests and the wildlife that inhabit it. I was absolutely convinced that we should do it, and so today I'm sharing my travel journal entry from that day of our trip. We upped and packed the car and said goodbye to Banff. 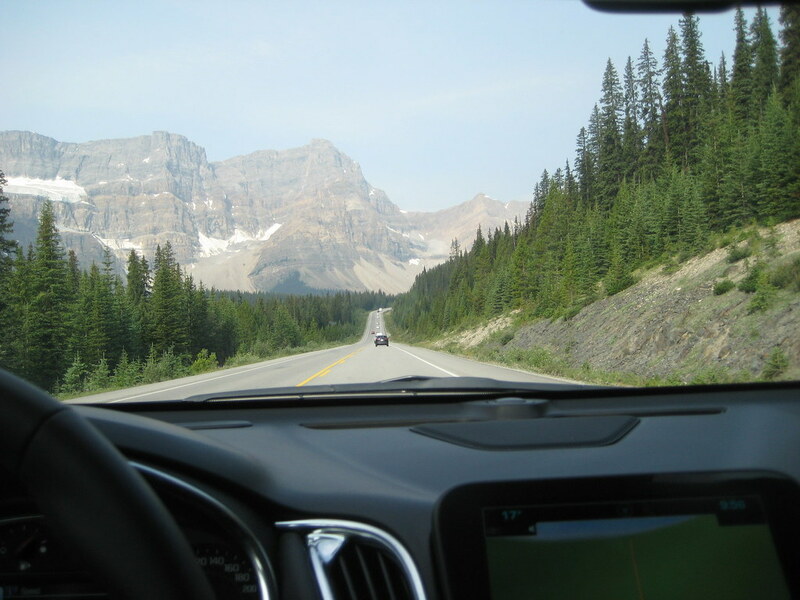 It was time to drive to Jasper along the famous Icefields Parkway. We took the Trans Canada Highway 1 (I'm complete down with the Canadian road system now) out as far as Lake Louise and then joined Highway 93: the Icefields Parkway, 230km. The road was mostly one lane each way and it meandered through the heart of the Rockies with stunning scenery on every side. Mountains towered over us, carpeted with pines, rocky, craggy tops looming grey and imposing. It was pretty magical, and easy to drive along with a bunch of RVs for company and a speed limit of 90 km/h which no one obeyed. We passed impossibly blue rivers and lakes, stopping to admire Bow Lake and give Dad a try at driving the car. We snaked up to a viewpoint looking back over the valley, the road snaking back behind us, and I took to the wheel again as we hit the glacier national park, where tongues of frozen ice rivers reach down from improbably lofty beginnings. 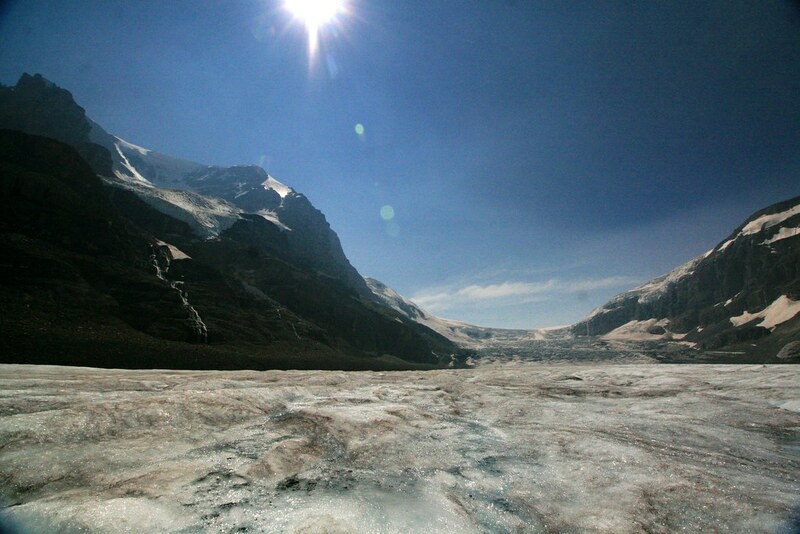 We stopped at the Athabasca glacier for lunch and a cuppa (hello delicious pizza pretzel!) 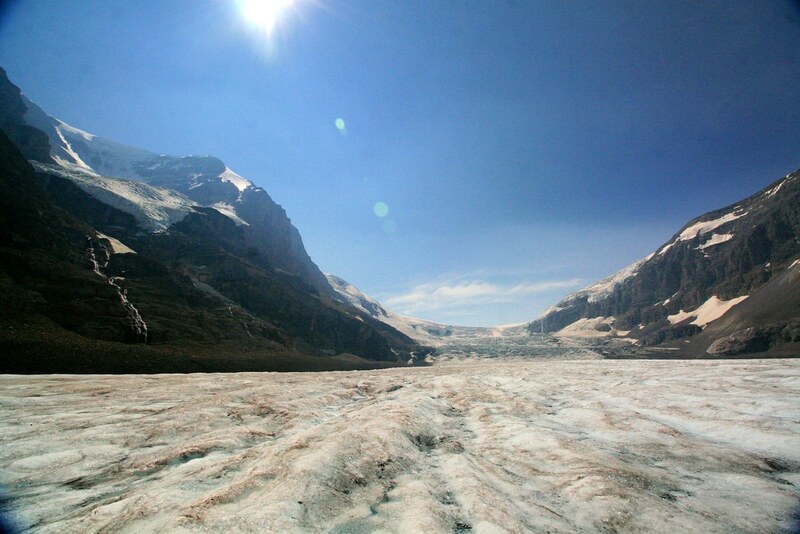 and then did the glacier adventure tour. 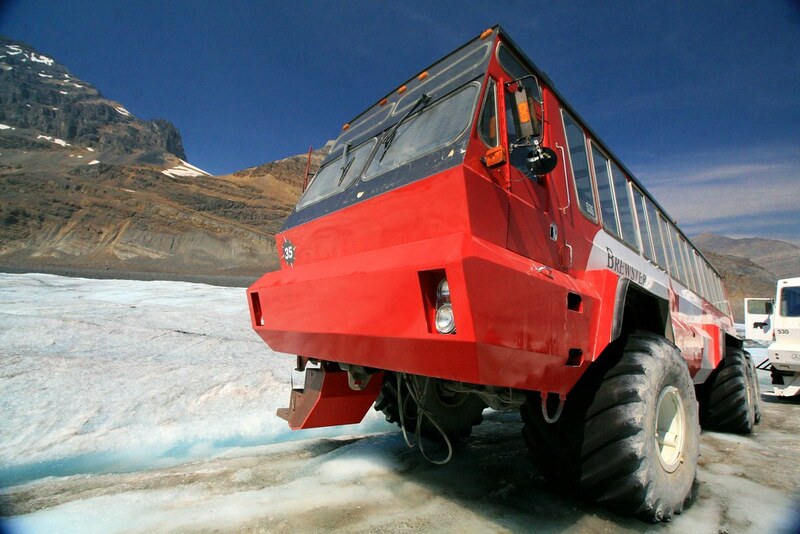 We transferred to the edge of the glacier in a coach and then boarded an enormous ice crawler: a giant vehicle capable of traversing the glacier and ploughing along on giant wheels ($5000 every time you need a new tyre) through almost any terrain. We drove down the edge of a morraine: a pile of rock and debris caused by the slow progress of the glacier. The slope was a 32% gradient which raised a few eyebrows, although apparently the vehicles can cope with 36%. Yikes! Dad loved it and decided he’d like to get one. Sadly there are only 24 of them in existence, 22 of which are used for this tour, and all of which cost $1.3 million a pop. Dad's dreams of giving tours over the Yorkshire Moors at 50p a go will have to wait. We had time to stretch our legs on the glacier, I filled my water bottle with the freezing, ice-clear run-off water and we snapped a few pictures - it was chilly, even though the sun was beating down! Then it was back on the crawler, back to the coach and on to the Skywalk. 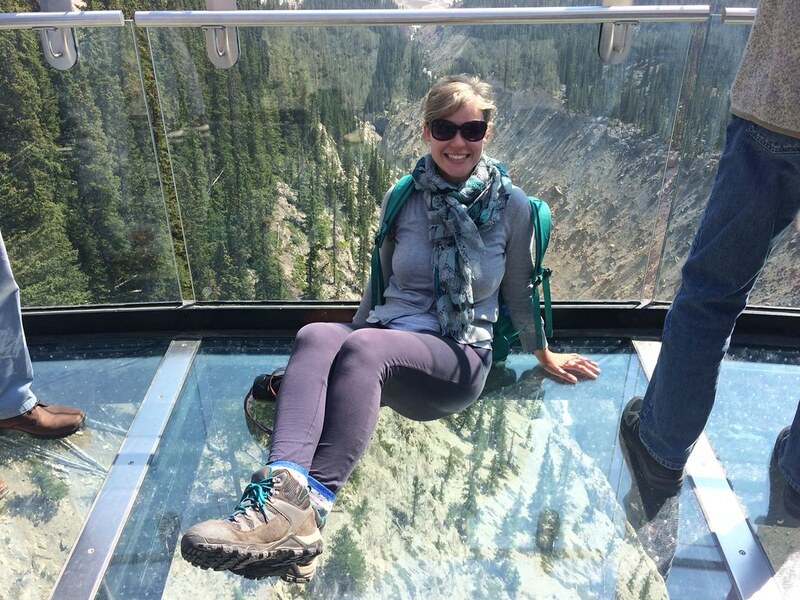 This was a huge semi-circular platform out over the valley with great views of the Rockies and we amused ourselves taking pictures. After that, it was back to the car to drive the rest of the way to Jasper. 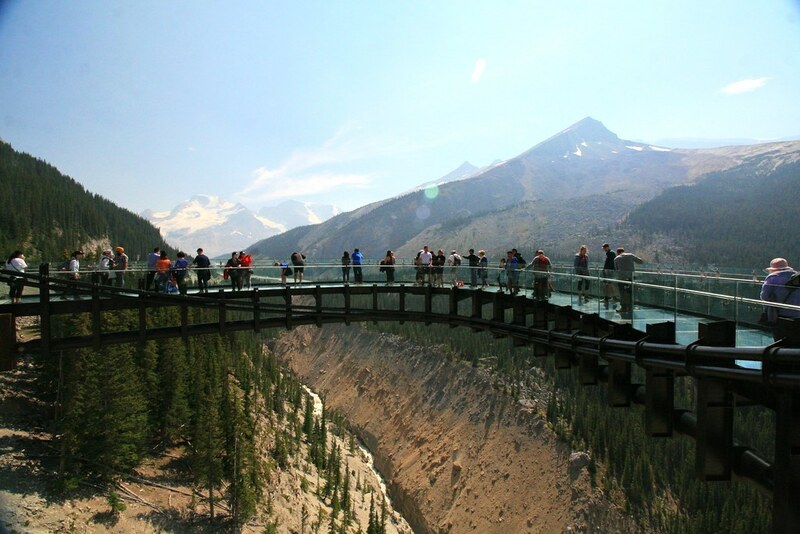 The views continued to be incredible but grew hazy as smoke from forest fires in BC drifted into the atmosphere. It was crazy the impact this had, as formerly invisible mountains would loom suddenly out of the gloom. We spotted wildlife - a few goats and deer, one elk bobbing his head up above the verge and even a bear! That was pretty exciting to see a black bear just hanging out beside the road - he was up on his hind paws, leaning on a tree with his back to us. We filled up the tank in Jasper (thank goodness the car turned out to be petrol - bit unsure) and drove the last 50km to our lodge. It was in the middle of nowhere but really lovely and we stayed in a secluded little chalet. We had a fabulous dinner in the lodge’s quite upmarket restaurant, and it had a cosy mountain vibe - probably great for skiing. Our chalet had a wrap-around terrace/balcony and it was nice to sit out and look at the trees marching down the valley, the sun burning a dull red against the haze and the occasional mountain just about visible through the haze. 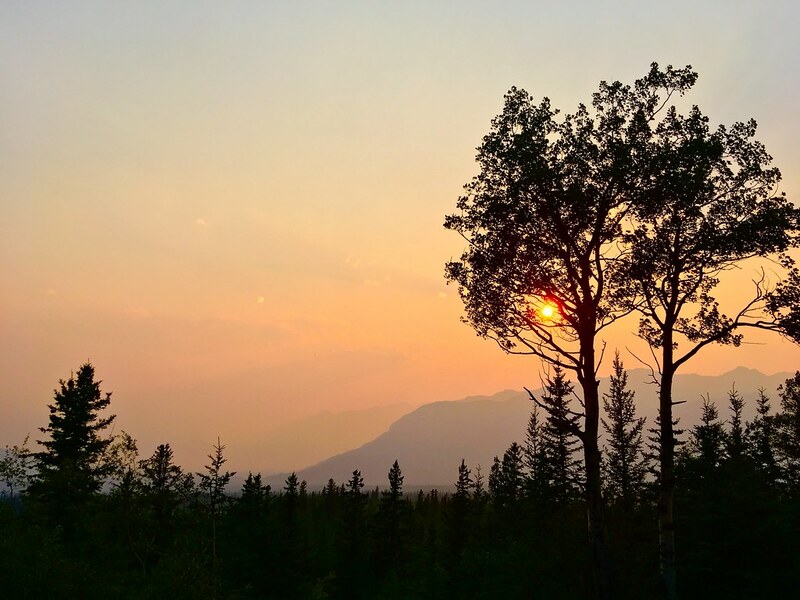 It's so lovely to see these photos of my beautiful province, Alberta, which make me realize how lucky I am to live here! I'm happy you enjoyed your visit.